Ephemeris for Tuesday, March 13th. The Sun will rise at 7:58. It’ll be up for 11 hours and 47 minutes, setting at 7:46. The Moon, 4 days before new, will rise at 6:42 tomorrow morning. With the Big Dipper up in the northeastern sky it is a sign that spring is coming. At 9 p.m. The Big Dipper can be used to find other stars and constellations. 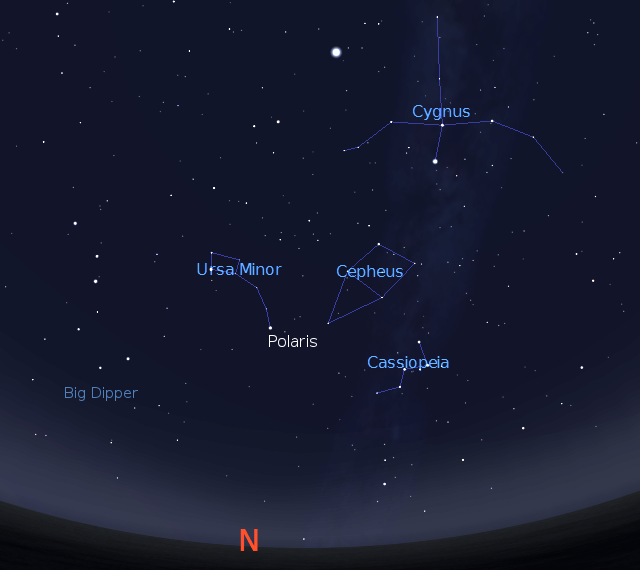 The Big Dipper’s most famous function is in locating Polaris the North Star. It’s a good way of finding directions at night. The altitude of Polaris, that is angle above the horizon, will give one’s approximate latitude north of the equator. 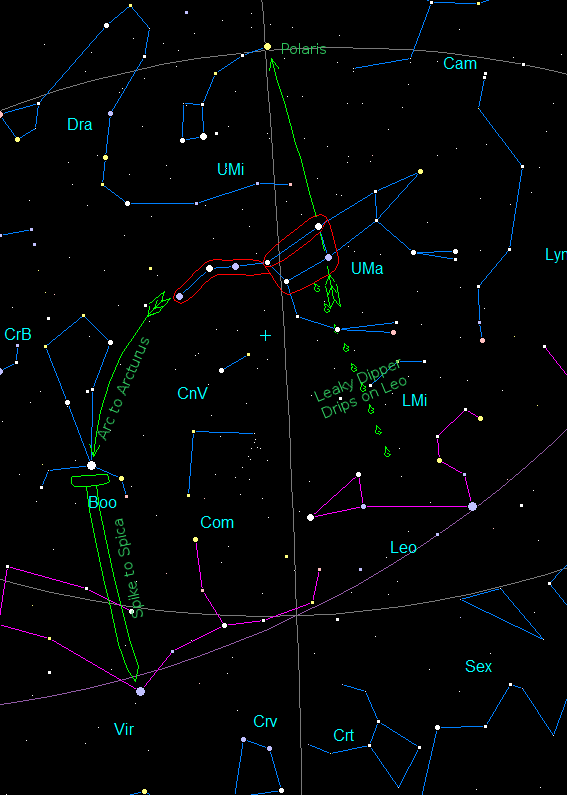 Another constellation that can be found is Leo the lion. It is rising in the east in the evening, but it can also be found from the Big Dipper by imagining that a hole were drilled in the bottom of the bowl to let the water leak out. It would fall on Leo’s back. The Big Dipper can be used to find two more stars, but they have not yet risen. 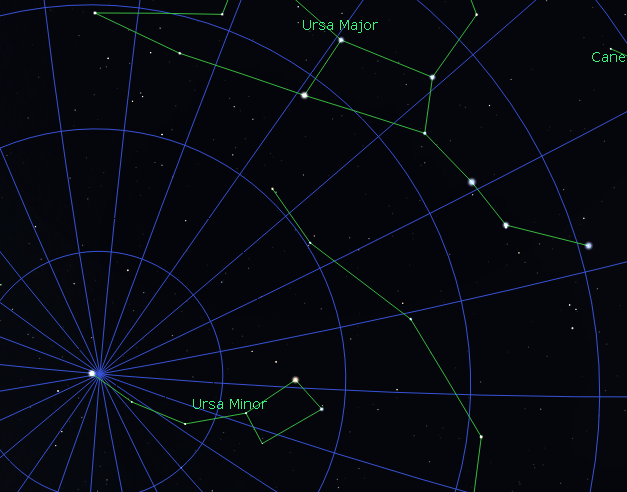 The Big Dipper points to Polaris, the, North Star, and to Leo the lion at 9 p.m., March 13th. In another hour the 4th brightest night-time star Arcturus will appear above the eastern horizon pointed to by the arc of the handle of the Big Dipper. We’ll revisit the Big Dipper next month when Arcturus and Spica will also be found by the use of the Big Dipper. Created using Stellarium and Libre Office. Ephemeris for Thursday, November 9th. The Sun will rise at 7:31. It’ll be up for 9 hours and 49 minutes, setting at 5:20. The Moon, 1 day before last quarter, will rise at 10:59 this evening. The stars of the autumn skies hold forth now, but one prominent autumn constellation never leaves us, here in northern Michigan. 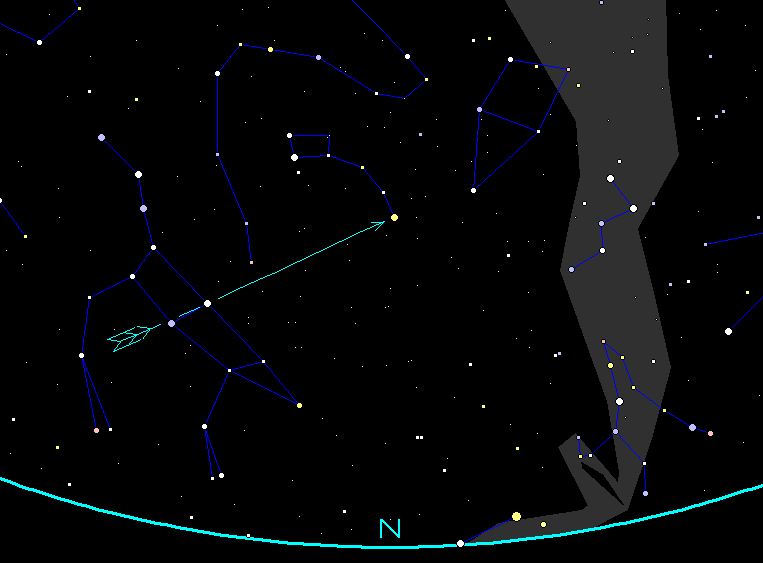 Look high in the northeastern sky by 8 p.m. and you can find the W shaped constellation of Cassiopeia the queen. It is opposite the pole star Polaris from the Big Dipper, slinking low in the north-northwest. There’s a dim star that appears above the middle star of the W which turns the W into a very crooked backed chair. Above and left of Cassiopeia is a dim upside down church steeple shaped constellation of Cepheus the king. The Milky Way flows through a corner of Cepheus and Cassiopeia toward the northeastern horizon and through the constellation of Perseus the hero, and the bright star Capella in Auriga the Charioteer. Cassiopeia and constellations along the Milky Way in the northeast these autumn evenings. (8 p.m. November 9, 2017). Click on image to enlarge. Created using Stellarium and GIMP. Ephemeris for Monday, August 28th. The Sun will rise at 7:00. It’ll be up for 13 hours and 25 minutes, setting at 8:25. The Moon, 1 day before first quarter, will set at 12:19 tomorrow morning. The bright star Polaris is a very important star. It is also known as the North Star and the Pole Star. Its unique position is nearly directly at the zenith at the Earth’s north pole, making it a very important navigational star. It’s about 40 minutes of arc, or about one and a third Moon diameters away from the extension of the Earth’s axis into the sky. As a rule of thumb, it’s angular altitude above the northern horizon is approximately one’s latitude, and it stands about at the due north compass point. 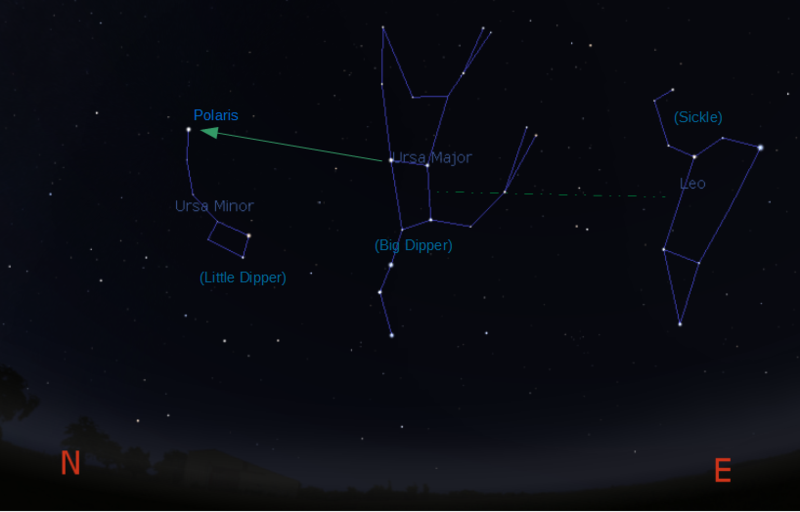 Polaris is found using the Big Dipper, using the two stars at the front of the dipper bowl to point to it. It’s located at the tip of the handle of the very dim Little Dipper, which this time of year in the evening appears to standing on its handle. Animation of the rotation of the sky around Polaris on the night of August 28/29, 2017. Created using Stellarium and Filmora. I’ve left the constellation lines off. The Big Dipper is seen easily as is Cassiopeia’s “W” opposite it around the stationary Polaris. Ephemeris for Thursday, May 26th. Today the Sun will be up for 15 hours and 12 minutes, setting at 9:16, and will rise tomorrow at 6:03. The Moon, 3 days before last quarter, will rise at 1:02 tomorrow morning. The star Polaris is perhaps the most important star in the northern hemisphere sky. That’s because it is nearly over the Earth’s north pole. It’s also called the North Star or the Pole Star. Polaris can be found by using the two stars at the front of the bowl of the Big Dipper, These two stars, we call Pointer Stars do point very accurately to Polaris. It is not the brightest star as some think, but a brighter than average star in a most unique position in the sky. During the lifetimes of those now living Polaris will be getting slowly closer to the pole. It won’t reach it, but in 100 years will begin to recede from the pole. The altitude of Polaris in degrees approximately equals ones latitude. Looking North at the Big Dipper pointing at Polaris. Created using my Looking Up program. Closeup of Polaris and the Celestial North Pole. The declination lines are 1 degree apart. Created using Cartes du Ciel (Sky Charts). Ephemeris for Tuesday, August 18th. The Sun rises at 6:48. It’ll be up for 13 hours and 55 minutes, setting at 8:44. The Moon, half way from new to first quarter, will set at 10:31 this evening. A look to the northeast at 10 p.m. or later will reveal a letter W pattern of stars. This is the constellation of Cassiopeia the queen. Cassiopeia is so far north that it never sets for us in Michigan. It is opposite the pole star Polaris from the Big Dipper. So as the Big Dipper is rotating down the sky in the northwest, Cassiopeia is rotating up in the northeast. The pivot is the star Polaris, the north star. There’s a dim star that appears above the middle star of the W which turns the W into a very crooked backed chair. Above Cassiopeia is a dim church steeple shaped constellation of Cepheus the king. The Milky Way flows through Cassiopeia and a corner of Cepheus and up through Cygnus, and on to the south. Cassiopeia and nearby constellations mentioned in the above program. Created using Stellarium.